The countdown has begun, only one more week until the artistic fireworks will be unleashed to the town of Drogheda. And Droichead is busy, very busy to get everything ready to offer you a splendid weekend. On the 30th of April Drogheda’s 6th Arts Festival kicks off and Droichead is once more very excited to be part of this vibrant cultural events weekend in the town. The May Bank Holiday weekend offers something for everybody: Visual Arts, Music, Theatre, Performances, Workshops, Family Day… you name it. Droichead has a range of events lined up. 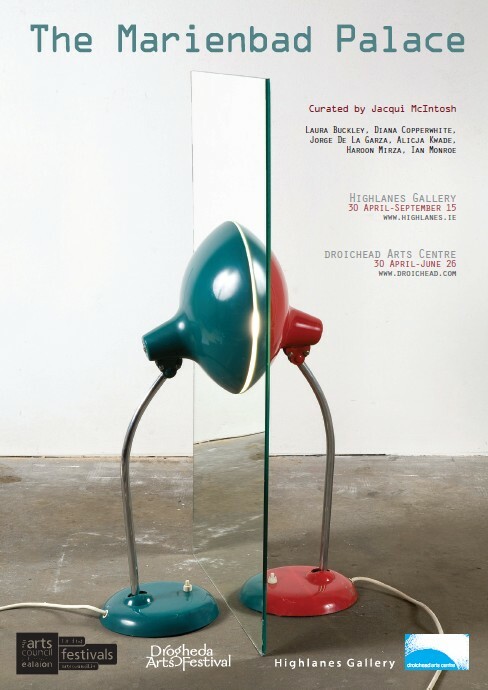 The Marienbad Palace exhibition, in conjunction with the Highlanes Gallery brings works together by Laura Buckley, Diana Copperwhite, Jorge De La Garza, Alicja Kwade, Haroon Mirza and Ian Monroe. The works shown within the exhibition explore ideas of reality beyond our everyday experiences of space and time. We are also delighted to have ME (Mobile/Evolution) lined up. This show threads together humorous stories with amazingly challenging ways of using crutches. On Saturday the 1st of May West Street turns into Wonderland and Droichead also offers plenty of workshops for teenagers in film and music. And this is only a selection of the wide range of activities lined up for the May Bank Holiday weekend. All the venues are in the town centre and on walking distance from each other so dive into the world of creative wonders and enjoy every bit of the Drogheda Arts Festival. Check out the website for full details of all the events. This entry was posted on April 20, 2010 at 10:59 am and is filed under Events/ Festivals. You can follow any responses to this entry through the RSS 2.0 feed. You can leave a response, or trackback from your own site.